Titles Tell Stories , yes they certainly do. If you own a camera and some books, show me the stories your titles tell. The best submission will win a prize. What this prize is, I have no idea, but I'll come up with something and it will be awesome. * Now before you freak out because I own a book called Faggots you might want to first read about the author Larry Kramer---an American playwright, public health advocate and gay rights activist. 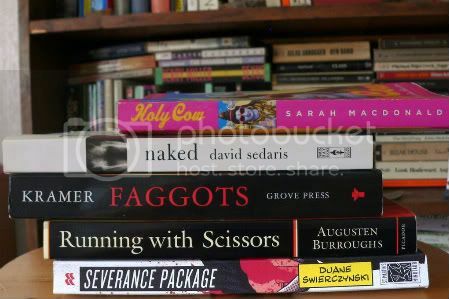 So don't trip, Faggots is sometimes required reading for Queer Theory/Queer History classes. Hmmm....maybe you uploaded the wrong picture? Click on the link in my post right below the photo that says "Titles Tell Stories." Ooops! Now I get it. DOH!